Borobudur is a giant Mahayana Buddhist monument in Central Java. Built in AD 800, the monument was lost for hundreds of years following the decline of the Buddhist kingdoms in Java. Borobudur was rediscovered in the 19th century, rescued from the surrounding jungles, and today is a major Buddhist pilgrimage site. Borobudur is built on a stupendous scale - it couldn't be otherwise, as it is nothing less than a representation of the cosmos as Buddhist theology understands it. Once you enter Borobudur, you find yourself being led into an intricate cosmology immortalized in stone, which is a magnificent trip for amateur archaeologists, albeit one that will require an experienced guide to decipher. For a thumbnail look at this Buddhist stupa's long history, read Asian History Guide Kallie Szczepanski's article on the Borobudur temple. The monument is shaped like a mandala, forming a series of platforms - five square platforms below, four circular platforms above - riddled with a pathway that takes pilgrims through three levels of Buddhist cosmology. Visitors climb steep stairs to each level; the walkways are decorated with 2,672 relief panels that tell stories from the Buddha's life and parables from Buddhist texts. To view the reliefs in their proper order, you should start from the east gate, circulating clockwise then climbing one level up as you complete a circuit. The lowest level of Borobudur represent Kamadhatu (the world of desire), and is decorated with 160 reliefs showing ugly scenes of human desire and their karmic consequences. The illustrations are supposed to motivate the pilgrim to escape their earthly shackles for Nirvana. The lowest platform actually shows only a fraction of the reliefs; much of the lowest part of Borobudur was buttressed with additional stonework, covering some of the reliefs. Our guide hinted that some of the more salacious reliefs were covered up, but there's no evidence to support this. As the visitor ascends towards Rupadhatu (the world of forms, comprising the next five levels up), the reliefs begin to tell the miraculous story of the Buddha's conception and birth. The reliefs also show heroic deeds and parables taken from Buddhist folklore. Ascending towards Arupadhatu (the world of formlessness, the four top levels of Borobudur), the visitor sees perforated stupas enclosing Buddha statues within. Where the first four platforms are bordered on both sides with stone, the upper four levels are open, revealing expansive views of the Magelang regency and Merapi volcano in the distance. 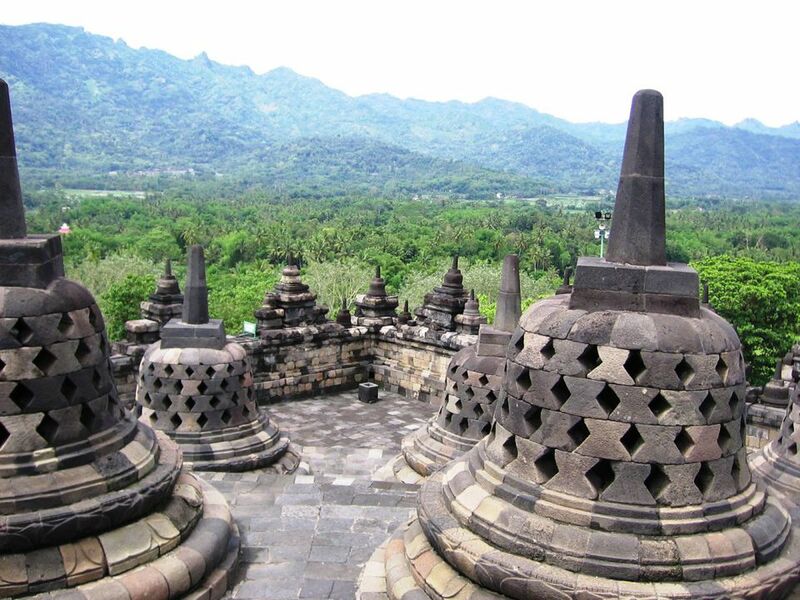 At the very top, a central stupa crowns Borobudur. Average visitors are not permitted to enter the stupa, not that there's anything to see - the stupa is empty, as it symbolizes the escape to Nirvana or nothingness that is the ultimate goal of Buddhism. The Buddha statues on the lower four levels of Borobudur are positioned in several "attitudes" or mudra, each referencing an event in the Buddha's life. Bhumi Sparsa Mudra: the "seal of touching the earth", posed by the Buddha statues on the east side - left hands laid open on their laps, right hand on right knee with fingers pointed downward. This references the Buddha's fight against the demon Mara, where he calls upon Dewi Bumi the earth goddess to witness his tribulations. Vara Mudra: representing "charity", posed by the Buddha statues on the south side - right hand held palm up with fingers on right knee, left hand laid open on lap. Dhyana Mudra: representing "meditation", posed by the Buddha statues on the west side - both hands placed on lap, right hand on top of left, both palms facing up, two thumbs meeting. Abhaya Mudra: representing reassurance and the elimination of fear, posed by the Buddha statues on the north side - left hand laid open on lap, right hand slightly raised above knee with palm facing front. Vitarka Mudra: representing "preaching", posed by Buddhas on the balustrade of the top square terrace - right hand held up, thumb and forefinger touching, signifying preaching. The Buddha statues on the higher levels are enclosed in perforated stupas; one is purposely left incomplete to reveal the Buddha inside. Another is supposed to give good luck if you can touch its hand; it's harder than it looks, as once you stick your arm in, you have no way of seeing the statue inside! Many Buddhists visit Borobudur during Waisak (the Buddhist day of enlightenment). On Waisak, hundreds of Buddhist monks from Indonesia and further afield begin at 2am to make a procession from nearby Candi Mendut, walking the 1.5 miles to Borobudur. The procession goes slowly, with much chanting and praying, until they reach Borobudur at about 4am. The monks will then circle the temple, ascending the levels in their proper order, and await the appearance of the moon on the horizon (this marks the birth of the Buddha), which they will greet with a song. The ceremonies end after sunrise. For more information on this major Buddhist holiday, read this article: Vesak in Southeast Asia, or peruse this gallery: Images of Vesak in Southeast Asia. Entrance fee for Borobodur is $20; the ticket offices are open from 6am to 5pm. You can also get a combined Borobudur/Prambanan ticket for IDR 360,000 (or about US$28.80, read about Indonesia money). The nearest convenient airport is at Yogyakarta, about 40 minutes away by car. By bus: Go to the Jombor bus terminal (Google Maps) in Sleman north of Yogyakarta; from here, buses regularly commute between the city and the Borobudur bus terminal (Google Maps). The trip costs IDR 20,000 (about US$1.60) and takes about an hour to an hour-and-a-half to complete. The temple itself can be reached within 5-7 minutes' walk from the bus terminal. By hired minibus: This is the easiest way to get to Borobudur, but not the cheapest: ask your Yogyakarta hotel to recommend a minibus tour package. Depending on the package inclusions (some agents may include side trips to Prambanan, the Kraton, or Yogyakarta's many batik and silver factories) the prices may cost between IDR 70,000 to IDR 200,000 (between US$5.60 to US$16). From the nearby Manohara Hotel, you take a Borobudur Sunrise Tour that brings you to the temple at the ungodly hour of 4:30am, letting you see the temple by flashlight until sunrise arrives. The sunrise tour costs IDR 380,000 (about US$30) for non-Manohara guests, and IDR 230,000 (about US$18.40) for Manohara guests.